how big is 80′ x 38′? The short answer is “too damn big”, but many people have no idea just what those dimensions look and feel like in the actual world, and we want to offer more than a conclusion about the size of the proposed Schenectady Casino pylon signage. Luckily, here in Schenectady, we have a well-known structure right on State Street at Erie Boulevard that helps put the monster pylon into perspective. It is the former Masonic Temple, at 302 State Street, which is now the home of the Alcohol and Substance Abuse Council. 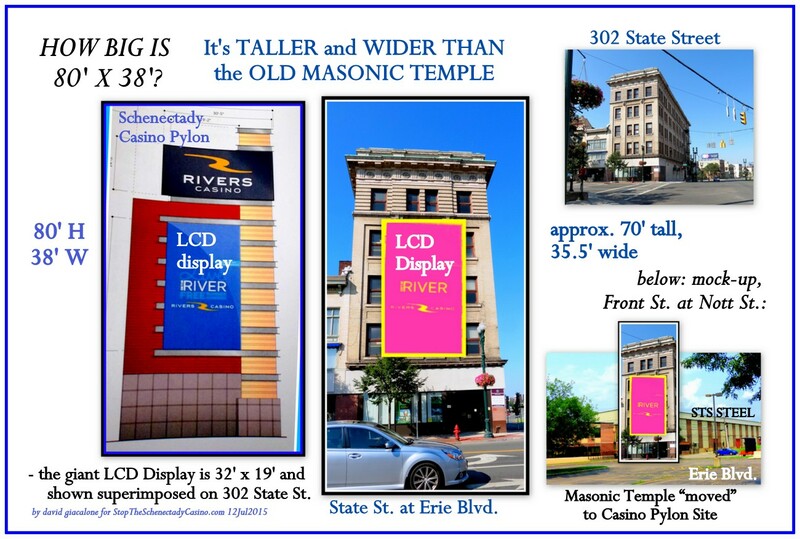 To sum up the comparison: the proposed pylon sign is both taller and wider than the Masonic Temple. But unlike Pittsburgh, Schenectady’s casino will include an 80-foot-tall entrance sign, one developers say is needed because of how the casino is tucked into the old Alco property. 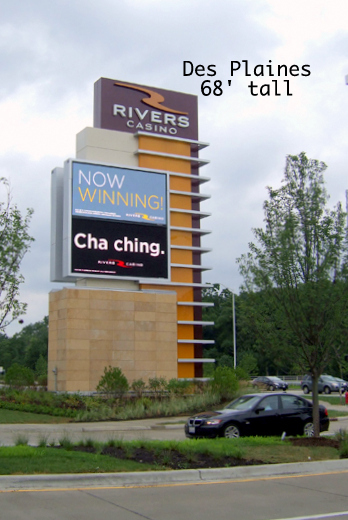 Rush Street’s Rivers Casino in Des Plaines has the only similarly wide-and-tall casino signage that we have been able to find online. It is another reason we feel certain that the proposed Schenectady pylon is too big. The Des Plaines pylon is “only” 68′ by 25 ‘, and yet by any reasonable standard, it is objectionably large and looming and luminescent. See our posting “shrink that casino pylon“. This entry was posted in Schenectady Casino, Zoning/Planning and tagged giant casino pylon, Rush Street Gaming, Schenectady Casino, zoning for casinos by David Giacalone. Bookmark the permalink.